Chilly, damp weather brings with a desire to settle in, with a warm plate of comfort food. This dish is guaranteed to help warm you up on cold fall evenings! Michlynn and I always try to serve up healthy meals for our family, and that is usually best accomplished when you prepare everything from scratch. Now for our dirty secret! There are plenty of times we are in a rush, and need to get dinner on the table, PRONTO! This is one of the meals I came up with that you can cut a lot of corners, or do it all from scratch! 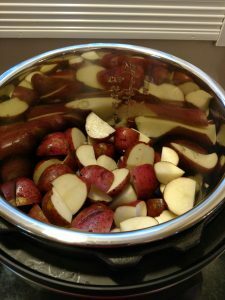 Evenly layer the potatoes in the bottom of your pressure cooker. Pour the chicken broth and garlic powder over the top. 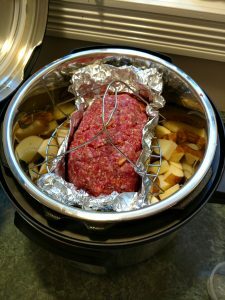 Place the rack/trivet that came with your Instant Pot over the potatoes, so it lays flat. Combine the ingredients for the meatloaf in a mixing bowl, reserving the BBQ sauce for later. Shape the mixture into a loaf shape. Place the loaf onto tinfoil, and wrap the foil up to the top edge, leaving the top exposed. Be sure to fold and tightly seal the corners, to keep the juices in the meatloaf! Place the meatloaf on the center of the rack, making sure it sits flat. Lock the lid, set the steam vent to “SEALING” and using the Manual setting, adjust it to cook for 20-25 minutes. When the cook time is up, turn the unit OFF or unplug it. Use the “Quick Release Method” to let the pressure escape. Check the meatloaf for an internal temp of 155 degrees. Carefully lift the rack and meatloaf out of the pot, and place the meatloaf onto a baking sheet. Baste the top with the BBQ sauce, and put it in the oven on “Broil” for 5 minutes to caramelize the topping. 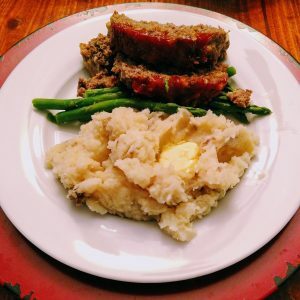 While the meatloaf is in the oven, add the butter to the potatoes and mash. If needed, add additional chicken stock, milk or liquid of choice to make them smooth and creamy. This recipe serves 4-6, depending on portion size. Depending on your tastes and dietary needs, this recipe is an easy one to adjust. You could easily do sweet potatoes instead of russet, or make the meatloaf gluten-free. A patient suggested, in honor of deer season, you should substitute venison. Serve with a side of asparagus or acorn squash, you won’t be disappointed! We hope you enjoy this delicious meal, and it warms your dinner table and your spirit! This is the second in our series on our favorite quick, customizable Instant Pot recipes. Check our blog weekly for more ideas!